I know companies have painfully forced the year of the greek froyo upon us, but in a much more fun world, I want to call it the year of the candy bar inspired ice creams. Maybe Magnum kicked it off last year, or maybe good humor did, but we've all lucked out and this year has really taken off. We've got York and Mounds from Good Humor, Cadbury from Blue Bunny, and then Mars, oh Mars, how you've made me smile this year. It's a good year to be an ice cream blogger. 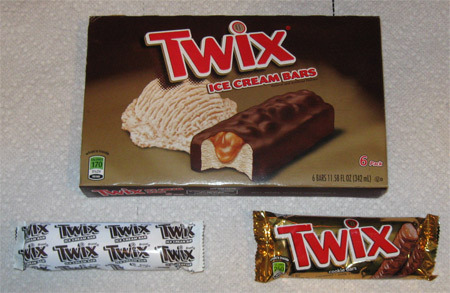 So tonight, we dig into one of my favorite candy bars, Twix, and it's upgraded counterpart, the full size Twix ice cream bar. Sure mini Twix ice cream treats have been around for quite some time (heck, I injured myself on one 4 years ago), but there's something special about a full size treat. Alright, it's that time, let's get ready to (tummy) rumble!!!! 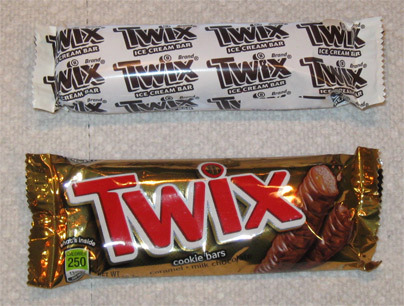 In the white trunks, the upstart punk with all the twix funk, the twix dream with the ice cream, the one, the only, the 1.93 ounce Twix Ice Cream Bar. In the gold trunks, the 45 year old import from across the pond, you know, the place with James Bond, it's the original 1.79 ounce Twix Cookie Bar. Ok, now right off the bat this isn't going to be a fair fight. There's two cookie bars versus one ice cream bar. 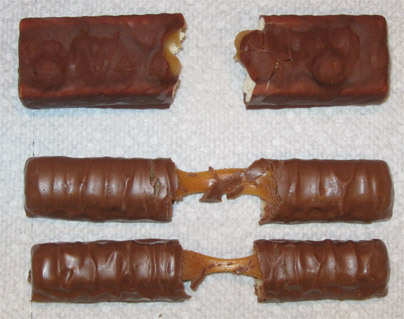 I think they tried adding the classic Twix ridges on the top, but they are hard to see. I'll admit it, at first glance, I want to grab the Twix candy bar first. I'm not 100% sure what I was going for in the criss-crossed picture, but now I think I want the ice cream more --- it's a shame that there's not an actual cookie bar at the bottom of the ice cream bar. Oh man, that would have been epic. My favorite shot of the whole bunch because it shows exactly what is going on here. 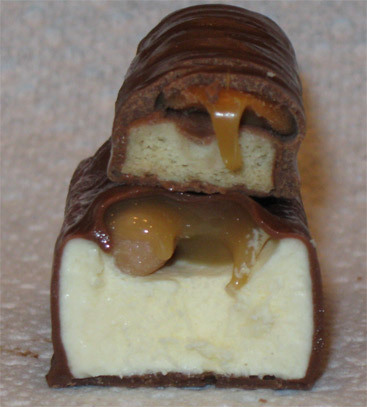 The little crunch balls in the Twix Ice Cream bar are indeed the same cookie wafers you find in a regular twix. Very Cool. 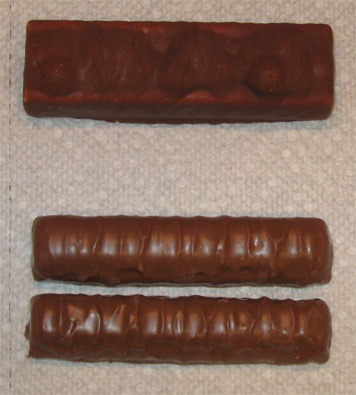 Now, do the two bars taste identical? Unfortunately now. The small cookie balls, while fairly prevalent, just aren't enough to juice up a true cookie bar vibe. If you are patient, and you focus on tasting twix, sure, you will taste it, but it's just not that strong. This is tough for me because I really enjoy both these bars. I've always loved Twix, and even though I think they aren't quite as good as they were say 20 years ago, I still think they are awesome. On the other hand, I love the construction of these ice cream bars. The ice cream is good, the shell is good, the caramel is familiar, and overall it's just a nice treat. I still think there's room for injury on the cookie balls, but hey, that's just a good excuse to take your time. And I mean that, savor these, they are excellent. And it's over.... or is it? ummm, what if I ate them at the same time? Ok, now it's over. I've now quintuple scooped these bars and I enjoy them more and more with each one I devour. 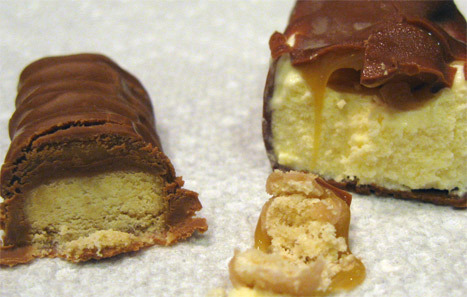 Nice job Mars, the Snickers ice cream bar now has worthy brothers in Milky Way and Twix. HA! good call getting them bumped up the list! Such a shame they didn't put actual cookies in the ice cream bar... Don't understand, why. It surely is possible.